Look behind you, a three-headed monkey! 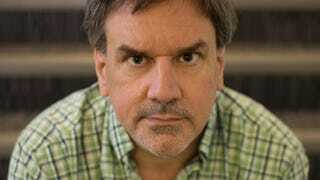 No, wait, that’s just Ron Gilbert, here to answer your questions on Kotaku today. Gilbert, a veteran game designer who helped create some of the greatest adventure games ever—Maniac Mansion, Monkey Island, Day of the Tentacle, etc.—has been working in video games for over 30 years now, bouncing around between companies like LucasArts (then Lucasfilm Games), Humongous, and Double Fine. Gilbert will be answering questions in the comments starting at 1pm ET. Ask whatever you’d like. UPDATE: And we’re done. Special thanks to Ron for taking the time to hang out with us today.